Along with Rod Piazza (with whom he once played), James Harman, and the late Hollywood Fats, Junior Watson is one of the premiere exponents of blue-eyed Southern California beach blues. Marked by an uptempo beat, light arrangements and lots of solos, this is the blues you hear not only in San Diego and Los Angeles' beach bars, but throughout the Southwest. Watson plays an electrified hollow-body guitar, and makes the most of the fat tone, bringing elements of jazz into his music and emphasizing each note rather than aiming for speed. He is also a credible vocalist, although he shares the singing duties with Lynwood Slim and Brenda Burns here. 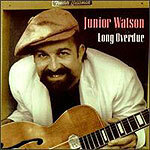 The band on this, Watson's first recording as leader, is top-rank. Longtime Mighty Flyer (Piazza's band) Bill Stuve is on bass, former Hollywood Fats and Piazza sideman Fred Kaplan is on keyboards. Bassist Larry Taylor and drummer Richard Innes handle the rhythm, while L.A. bluesman/disc jockey Juke Logan lays down some mean Hammond B-3. The songs are a combination of originals and covers of tunes by the likes of J.B. Lenoir, Pee Wee Crayton and Little Willie Littlefield. Whether you're a Southern Californian who just can't get enough, or are from another part of the world and are curious about the music scene our here, this is as good a set of SoCal blues as you'll find.